Is 432 Hz an expression of a deeper, more natural, perhaps even more cosmic concert pitch than 440 Hz? My immediate and clear answer is no! Proponents of this idea – and they are growing in number – do not seem to contemplate on the basis of what time, space, numbers and tones really are. For what exactly is a Hertz, and what does the numerical value of the frequency indicate? - 432 Hz, 440 Hz , etc. are points of reference. There are no tonal frequencies which are more pure than others – just as none of the beautiful colours of the rainbow spectrum are more pure than the others. We shall return to the matter of colours later as a direct correlation between tones and colours is often claimed by proponents of the the idea of the excellency of 432. - The notion is also often accompanied by an assumption that A=432 Hz is a more original concert pitch, not seldom it is launched with claims of ancient roots. You must then remember that the first time any tone frequency was determined was in 1636, when Marin Mersenne measured a tone of 84 Hz. - It is also important to keep in mind that the concert pitch, A, has alternated much throughout history and from place to place, even to the degree that the neighboring cities have operated with different standard pitches. You may find an outline on the history of the concert pitch at the Wikipedia entry on the subject. - The acclaimed conspiracy theories about Goebbels and the Nazi mindset as crucial to the setting of concert pitch at 440 Hz, speaks for itself. It is mere speculation. The value was decided by a majority of the participants at an international conference in London in 1939. It had been used as a standard in the U.S. since 1917 on the recommendation of the American Federation of Musicians and recognized at government level there long before the world had to take Nazism seriously. The value was recorded in 1955 by the International Standards Organisation and in 1975 was appointed as ISO standard , the most widely used standard worldwide. In short one Hertz indicates one cycle per second. It is a measuring unit of frequency. If you put forward the argument that a Herz value has its foundation in deeper natural law, you must also be able to demonstrate that the time unit one second is rather an expression of nature than culture. But let us take hold of the music! In a heptatonic major scale with fundamental C, A is the major sixth. The modern tempering practice of 12TET (an equally divided octave, all halftone steps are of the same relative size) is certainly not unproblematic. Thirds and sixths in this tuning come out around one seventh of a halftone off pitch seen in relation to the intervals based om the harmonic series. People pushing for 'natural ' tonal relationships would have a chunk with more meat on it by focusing on this issue . In 12TET C4 takes the value of 261.63 Hz and A4 = 440 Hz. 432 Hz is the major sixth from C4= 256 Hz in the Pythagorean tuning system. An octave is the frequency and wavelength ratio 1:2. You reach concert pitch A4 = 432 Hz by moving three perfect fifths (ratio 2:3), up from 256 Hz and one octave down. (= 256 x 27 /16). In other words, already quite fishy, how to get from the time unit of one second to the frequency value 432 Hz. And what does the time unit really indicate? One second is a subdivision of a day in 60x60x24 = 86,400 parts. Dissolved into prime factors, it is a day divided in 2^7 x 3^3 x 5^2. In other words that is also a rather complex affair and as phenomenon essentially an expression of culture, the work of the mind of man! Admittedly the low prime numbers 2, 3 and 5 are definitely charged with fundamental music as these factors in the harmonic series express the intervals perfect octave, perfect fifth and just major third respectively (Note: In that actual order!). However, 7-, 11- and 13 divisions also come to expression in the language of nature – and the following primes as well! In other words, both the time unit and the Pythagorean major sixth are essentially an expression of people's penchant for systematizing. - A measure of compliance with deeper nature? No! The concept ends all too easyly in speculative numerology. Of course, 432 Hz for practical reasons may feel good. This applies both to the transitions of registers of singers, string instruments which suffer less from tension and when generally trying to let some air slip out of the inflation which is indeed taking place in concert pitch (orchestral sound will be perceived as having more brilliance, when the pitch is raised a few Hertz relative to the reference, the ear has become accustomed to. Some orchestras exploit that fact by raising concert pitch even higher than 440 Hz). In practice, one must also ponder that the time measure one day is situated in a completely different dimension than the tonal frequencies of the octaves of music! The same is true of the correlations, which many in the fascination of a holistic language interprete as direct correspondences between planets, chakras, colours, etc. To return to an already established quality on a new level / a new turn of the spiral. All notes in the octave interval have the same name. And it is clear that red and violet, the terms of the slowest respectively the fastest frequency rate of the rainbow spectrum – which covers just short of one octave – are neighbours in the circle of colors (or – actually more precise: spiral of colours), not merely two polar opposites . - First of all, sound and colour are the expressions of two fundamentally different wave types, which do not interact with each other. Light is disseminated transversely, sound is disseminated longitudinally. - For both light and sound, there is a clear and direct relationship between frequency and wavelength. These are two sides of the same coin. We might as well identify a tone by its wavelength as by its frequency. In the world of colours it is actually the norm to identify by wavelengths. This is merely convention. However, importantly: If there is an octave relation between a tonal frequency and a color frequency of the rainbow spectrum, there is by definition no correspondence between the wavelengths, which after all are just as important as frequencies. The two waveforms refer to two different constants in the basic equation, they both have roots in: f x λ = c ( frequency multiplied by the wavelength equal a constant). The constant for the sound is the velocity of sound in the relevant media. The constant for light is the speed of light. - Just as tonal frequencies and the time interval of 24 hours find themselves in completely different oscillation dimensions, there is an enormous distance from the frequency of tones to the universe of colors. 40 octaves sounds very innocent, but it is gigantic. Please check the value of 2^40 for your self on a calculator ! - The two waveforms have very different span: Our ears may perceive 10-11 octaves tones, but as earlier mentioned we can see barely one octave of colors. This has important implications for how we structure the perception of the two fields respectively. - Verily it is universal that the octave is reflected in the proportion 1:2, but our perception of both music as colors are also tied to our sensory mechanism. And in the periphery – the very deep or very high notes – the interval 1:2 is not peceived as an octave . The octave spiral illustrates the inherent order of the harmonic series. The octaves are divided i 1-2-4-8- ... etc., partials. Here the first 16 are shown. - The deepest natural organisation of sound is the harmonic series. Here the octaves are divided in 2-4-8-16 - … etc. partials. The most natural division of colors is into three respectively six. In other words, it cannot be considered as an expression of deep reflection if you on the basis of a culturally conditoned heptatonic scale suggest a deep and direct correlation between seven colors, seven chakras, seven planets, … etc. Read my article on this subject (in Danish, sorry!)! 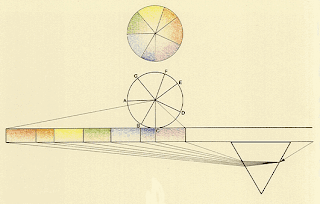 A large part of the misery has been caused Newton's division of the spectrum into seven prismatic colors from the beginning of the 18 century. It was put forward because he was intrigued by a possible link between astrology, alchemy, tones and colors. But indigo cannot be considered a primary colour and the general correspondence is at best poetic. Newton has had such an impact that virtually all lay people are convinced that the colour octave naturally divides into seven. It is actually not the case! - It is also striking that different<="" span="">target="_blank">synesthetes find very different correspondences between tones and colors. Putative correspondences between tones and colors must therefore be taken with a grain of salt and any simple equation of different fields of wave expression it would be wise to relate to poetically. 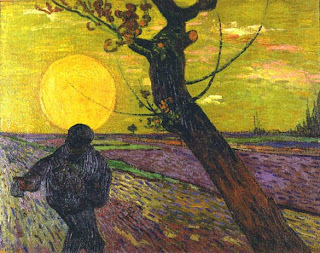 The sower who spreads his equal sign between loosely plowed fields, can not expect to see a large and fertile harvest. ... And some of the thrill of life is indeed precisely when the equation is not solved in the simplest conceivable way. Enjoy it! Cultivate when the equation does not solve itself immediately. Delve into the depths of differences as much as into the abyss of samenes. Then the possibillty of immersion may appear! It is a shame if you on your quest for a language larger than life insist on cultivating perspectives of mere speculation. Music is essentially the basis for a holistic language. 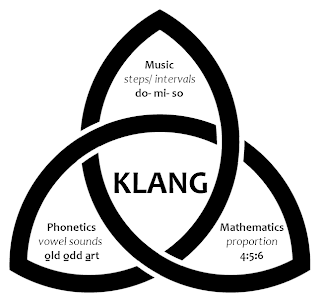 Through the concept of 'klang' (German and Scandinavian for the quality aspect of sound. 'Timbre' doesn't quite cover it) the harmonic series braids three primary fields of conception: Language (the timbre of wovel sounds), music (intervals) and mathematics (proportions). All are founded in the body, and we are presented with a first-class tool to decode time and space. Frequency and wavelength are time and space !